Lume Productions presents THE GULF, by Audrey Cefaly, at the FLOW Warehouse, 59 Denison St., Camperdown. 24 August - 5 September. 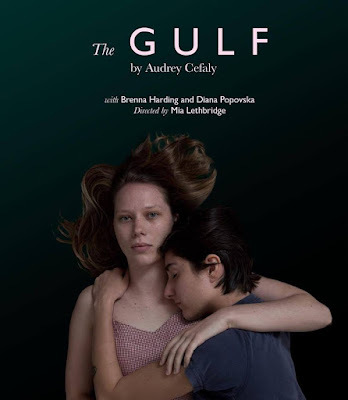 THE GULF, is by a young American (Southern) writer, Audrey Cefaly. It first appeared in 2016, and has two female characters - intimates - drifting in a boat in the Alabama Delta, part of the Gulf of Mexico, fishing and confronting the coming changes in their lives. Betty (Brenna Harding) is preparing to go to college and leaving town, while Kendra (Diana Popovska) from a different class (background) ponders her own more simple needs to have a future. The play is delicately written full of pregnant pause and poetic metaphor that is not uneventful in the location of the small boat and the lapping water. The gulf between the two widens and narrows, as time moves through them as the inevitable shifts in their lives begins to relieve them of their close relationship - a relationship that in its intensity, they may have believed would last forever. Both performers in a simply and beautifully designed setting on a traverse stage arrangement are directed attentively by Mia Lethbridge, sharing the story with their audience gently. They both deliver a sympatico relationship, with Ms Popovska especially impressive with a simple and truthful response to the writing she has to deal with, and the offers of her partner, in a nearly lived-in existence, pared back from being a performance to that of just 'being' - it is mesmeric - still waters in this gulf run deep! To meet a new writer and to see a new all female company of artists at work with such naive (new, learning) but passionate creative energies in a warehouse space in the inner Western suburbs of Sydney is quite re-assuring about the possible future of the performing arts landscape. As it was, last year, when attending a one act opera, IL TABARRO, in the warehouse for Alfie's Kitchen in the backstreets of Enmore, this experience can be exhilarating for more reasons than just the performance. THE GULF is only 60 minutes long and worth a visit if you are free. Raw but impassioned.